Situated only 300km from Johannesburg, Tintswalo Lapalala Wilderness lies in the heart of 44 500 hectares of untouched wilderness. The sheer expanse of the vast, game-rich reserve offers seclusion and a multitude of unique experiences. 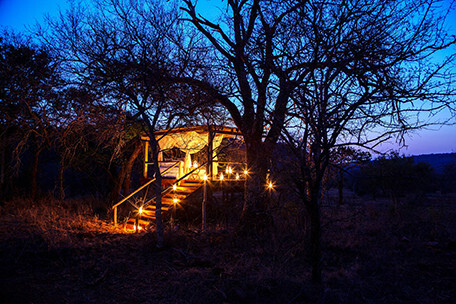 The family-friendly lodge comprises of only seven luxury tented suites with private plunge pools, en-suite bathrooms and outdoor baths and showers, and includes a 2-bedroom family tented suite. 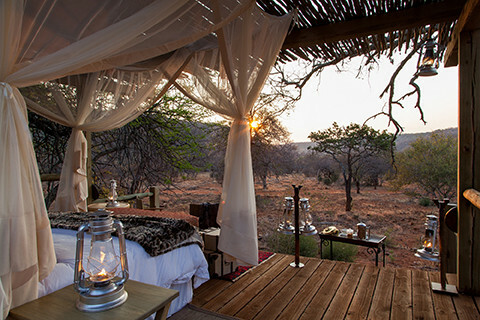 Raised above the surrounding bushveld on sprawling wooden decks, the eco-friendly lodge presents a sustainable wilderness and safari experience in the lap of luxury, with daily game drives and guided bush walks. 27km of pristine river frontage presents the unique opportunity to fish the crystalline mountain waters or swim in the bubbling rapids. More relaxing pursuits include sundowner cruises and riverside picnics, birdwatching and stargazing and spa treatments, as well as the option of a romantic sleep-out experience in a remote part of the reserve. Pretoria is a 3h30 drive. Game drives twice a day, all meals, selection of house drinks, activities such as hiking, fishing and viewing bushman paintings. What types of Food; our food philosophy is: Fresh, wholesome, farm to fork. Gate closes at 6pm, opens at 6am. The Waterberg Biosphere is one of 500 UNESCO-recognised biosphere reserves on the planet, and is the only savannah biosphere reserve in the world! Unique game like Sable, Rhone and black Rhino in addition to the big five. Visit the community project of the Wilderness school which has educated over 70,000 children of all colour and creed in the legacy of nature conservation over the last 30 years.